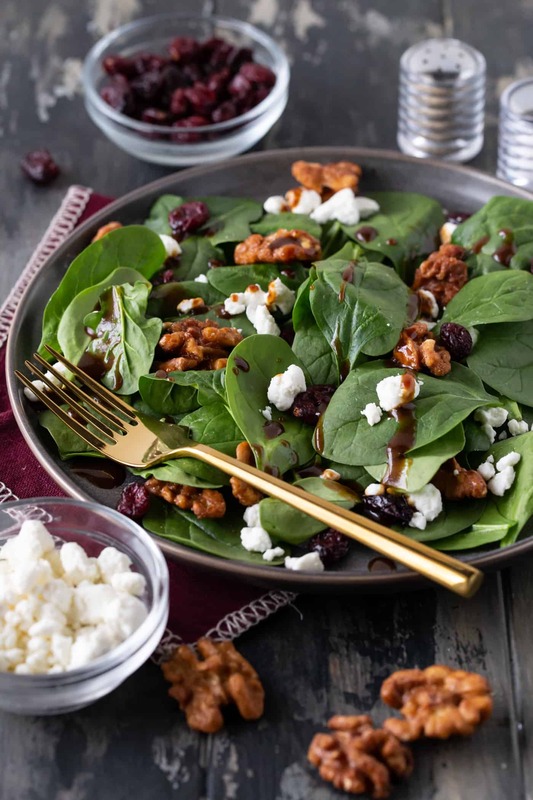 Our simple Spinach Salad with Goat Cheese, Craisins and a Homemade Balsamic Vinaigrette Recipe is our go-to side dish for entertaining! Need an easy way to add greens to your entertaining menu? 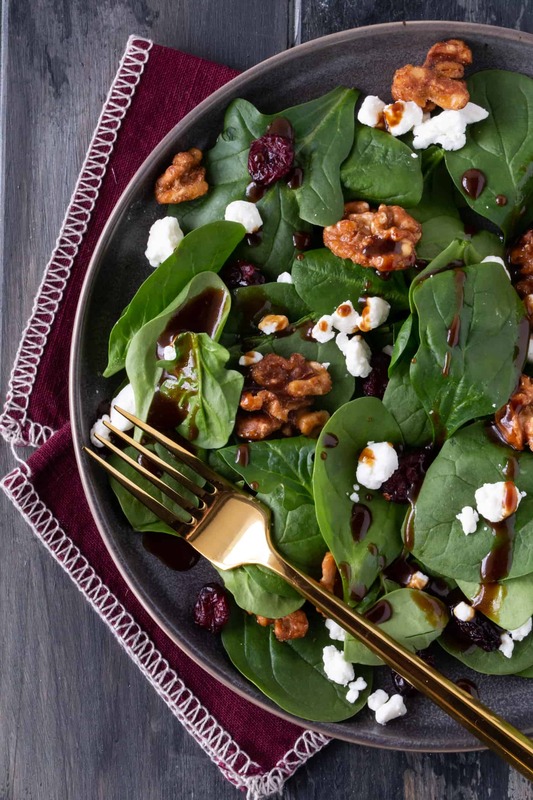 This Spinach Salad with Homemade Balsamic Vinaigrette Recipe makes a frequent appearance on our table. I generally have spinach on hand for smoothies and to add to other dishes, so it is a snap to make this salad for dinner without having to race to the store. It’s so easy and flavorful you’ll never go back to the bottled stuff again. 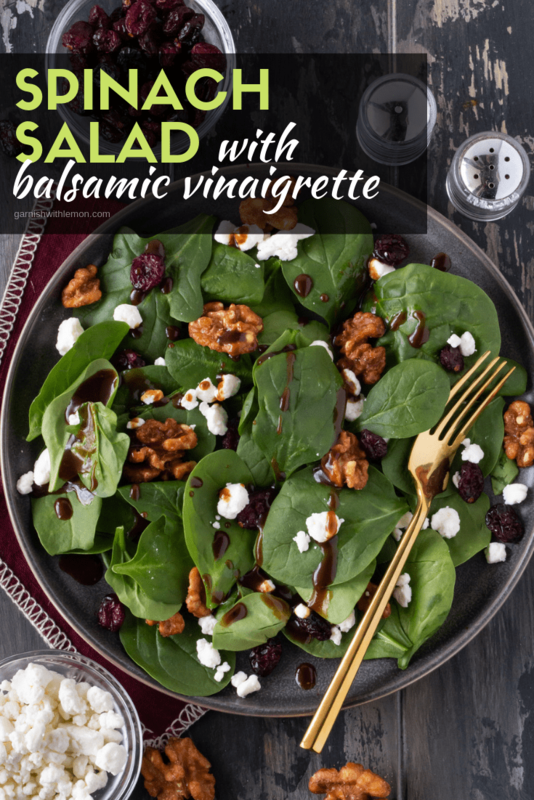 This balsamic vinaigrette recipe, in particular, is my go-to dressing; it mixes up quickly and uses ingredients from the pantry. It has a little dijon mustard in it to add some depth without overpowering it. Simple and delicious. What add-ins are good in a spinach salad? Add some goat cheese, craisins, and nuts, and you have yourself a fabulous salad. It’s packed with nutrients, full of flavor and so tasty – you really can’t go wrong. Add some grilled chicken, and you have dinner already done. How’s that for easy? I’m not a goat cheese fan. Can I use a different kind of cheese in this spinach salad? Goat cheese not your thing? 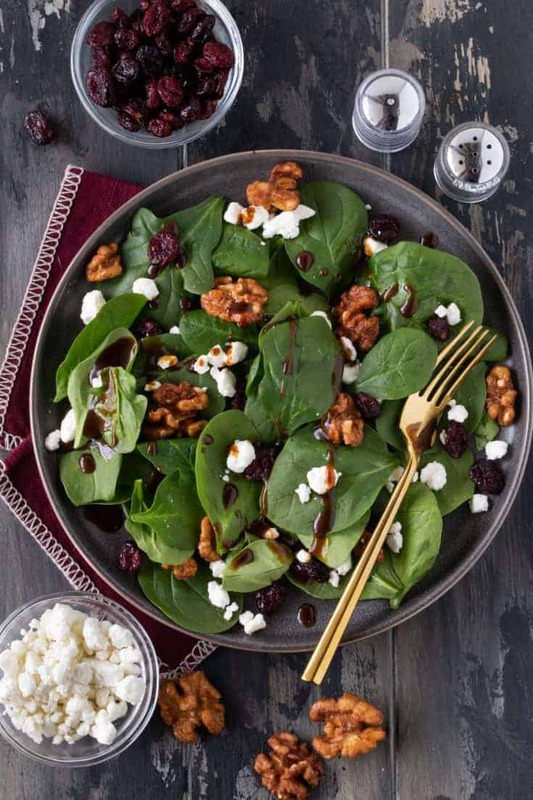 Feel free to add whatever you have on hand – feta, parmesan, gorgonzola – this spinach salad is so versatile, it goes with just about anything. Be creative and do what works for your family. Spinach salads are a great (and tasty) way to get your greens in. Do you have a favorite dressing? Share it with us! We love new flavor combinations! Need more ways to get your greens? Check out some of our faves! This versatile vinaigrette will become a staple in your kitchen. Place spinach, goat cheese, craisins, and nuts in a salad bowl. Whisk dressing ingredients together and drizzle over greens. Season to taste with fresh ground black pepper. This is very similar to one of my favorite salads, though I substitute Feta cheese for the goat cheese. I found my favorite brand of goat cheese is too soft. My salad is comprised of spinach, walnuts, feta cheese, and dried cranberries. Sometimes I’ll throw in some blueberries. The Balsamic Vinaigrette: 2 TBSP balsamic vinegar, 2 TBSP olive oil, ¼ tsp granulated garlic, ¼ tsp salt, 1 tsp brown sugar. Here’s another favorite salad: spinach, diced firm ripe pears, onion, dried cranberries, shredded parmesan. The dressing: 2 TBSP cider vinegar, 2 TBSP canola oil, 1 TBSP honey, ¼ tsp salt, ¼ tsp ground black pepper. Those combinations sound delicious! Thanks for sharing them! Had this salad for the first time at a wedding on the weekend. You can buy all the ingredients together from Loblaws in their pkg. salads. It is an organic salad kit. All I had to do was roast the walnuts and buy goat cheese. Going to accompany our pork loin roast with maple glaze and fresh green beans tonight! Thanks for the catch (and glad you enjoyed the salad! ).